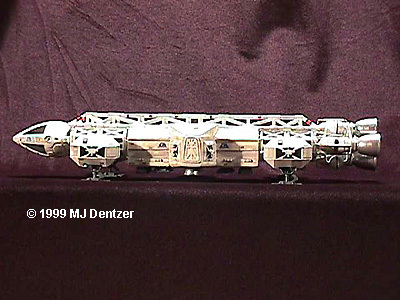 Michael Dentzer builds a multitude of Eagles. 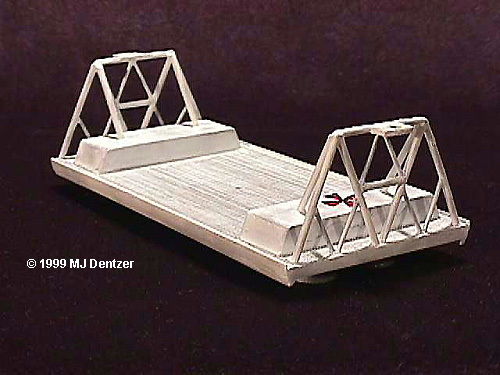 Image 3: Cargo sled, with winch. Image 4: Close-up of whinch. Image 6: Side view, with drums. Image 7: Cargo pallet, sans cargo. Image 8: Pallet, perspective view. 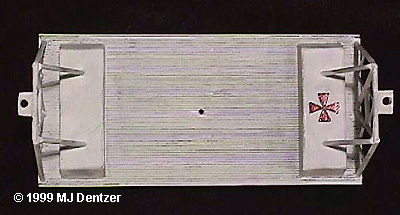 Image 9: Pallet, top view. Image 10: Pallet, side view. Image 17: Another perspective view. 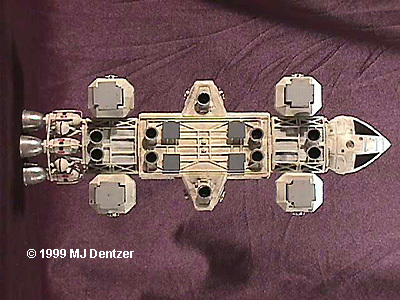 Image 18: Booster unit, overhead view. 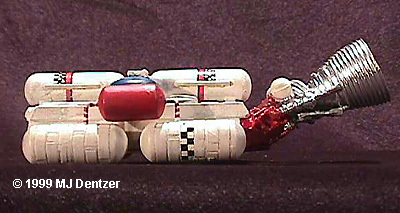 Image 19: Booster unit, side view. Image 20: Beauty shot of the booster. Image 22: Front oblique view. 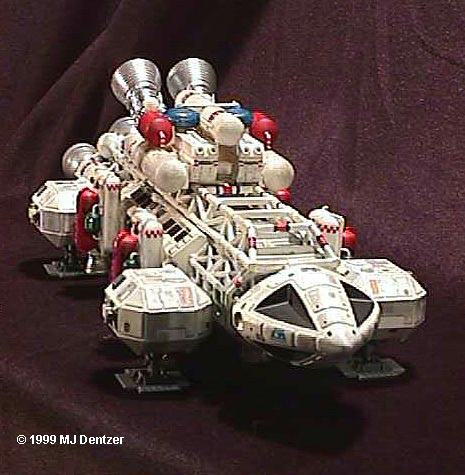 Image 23: Rear oblique view, showing off the engines. Image 25: Long axis view. It's September 13, 1999. 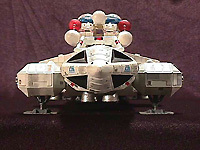 You’re on your way on a runaway moon into the great unknown reaches of space, and your survival on the lonely lunar outpost of Moonbase Alpha depends a great deal on the versatile Eagle spacecraft. It’s versatility is owed to its modular design and the ability to use different central modules to perform a variety of roles both on and off the moon. 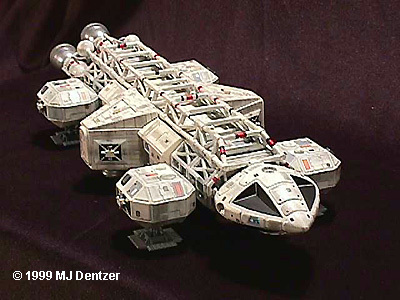 Presented here are some of the eagle pod variations seen in the two season run of Space:1999. 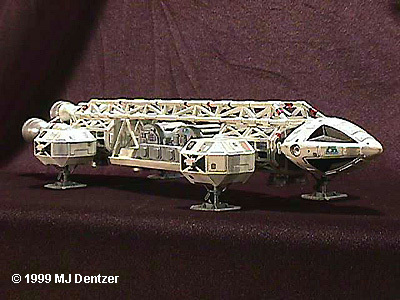 As the standard transport configuration has been treated elsewhere and is the version you get with the AMT/Ertl kit, this presentation will deal with the less familiar variations that make the Eagle such an interesting modeling subject. 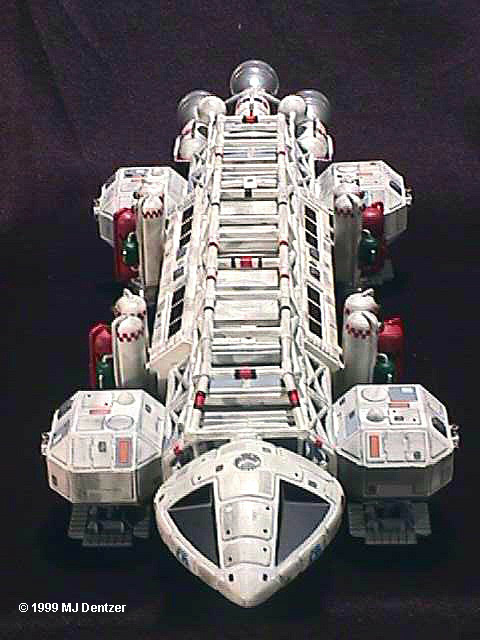 In the premiere episode of the show, Breakaway, the Eagle was shown in it’s freighter role transporting containers of nuclear waste via Moonbase Alpha from the denuclearized arsenals of Earth. Stored on the far side of the moon in underground silos, it was these closely gathered clusters of entombed radioactive waste that would cause a massive explosion and hurl the moon out of orbit. 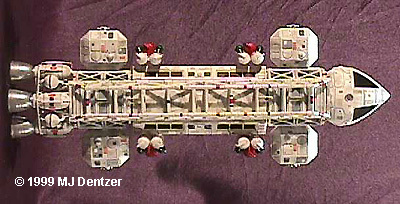 In a vain attempt to disperse the canisters, Eagles were fitted with a pallet module on which was placed a winch mechanism to pick up the cans and scatter them out over the lunar surface. 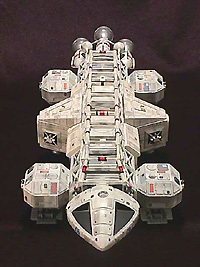 The cargo pallet was built using the bottom section of a standard transporter pod. A sheet of textured Evergreen styrene was laid on top of that. The engine housings are sheet styrene. I used a combination of styrene rod (large sections) and wire paper clips (smaller sections) to form the framework. 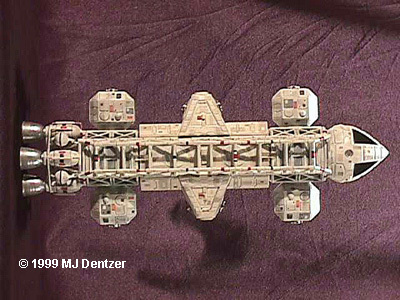 Two small bits of styrene were glued to the top of the frame and holes drilled so the module could be mounted with small screws under the Eagle’s spine frame. It was painted Testors MM flat white, weathered with pencil, and the red and black cross drawn on with a fine point permanent marker. 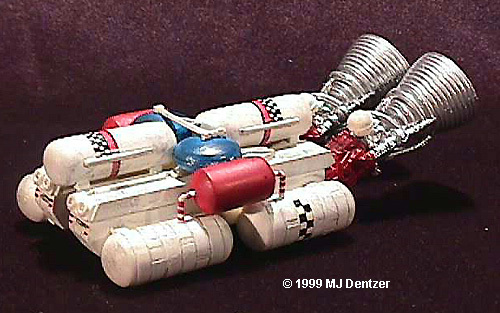 The little cans were made from old marking pen tubes, cut to size, and capped with little ceramic magnets, the kind you find on the back of those cheap and tacky refrigerator magnets. 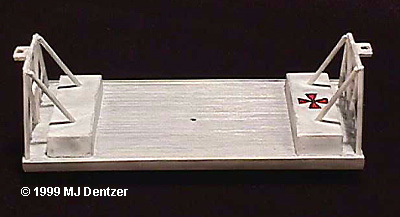 These were painted medium gray, the radiation markings and red rectangles are paper labels colored with permanent markers. 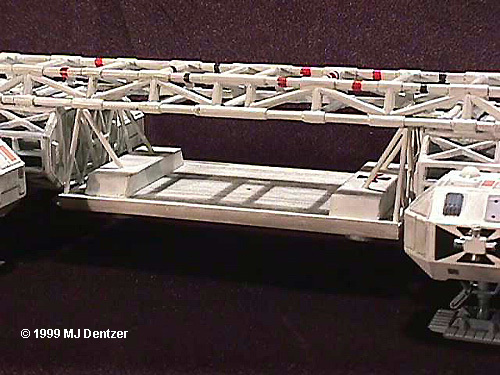 The winch assembly was built using sheet styrene for the base, and two halves of a 1:144 Apollo service module. I only had one complete module in the parts box, and rather than buy another kit, I split it in two and used sections of the tube from an old broken bicycle tire pump to complete the two sections. Thin styrene forms the endcaps, and bits from the parts box added for detail. 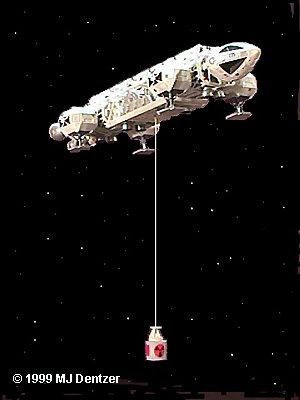 The grapple is built on another ceramic magnet and attached to a length of wire, at the top end of which is crimped a metal bugle bead that plugs into the bottom of the cargo pallet. 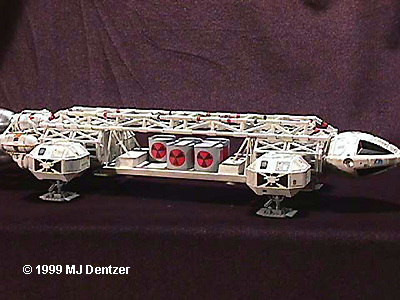 This is the Lab module from the Eagle Accessory Kit offered by the now (and sadly) defunct Scale Model Technologies. 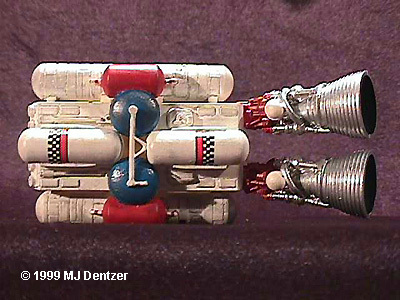 I got this as well as the Spine booster along with their excellent Laser Tank. 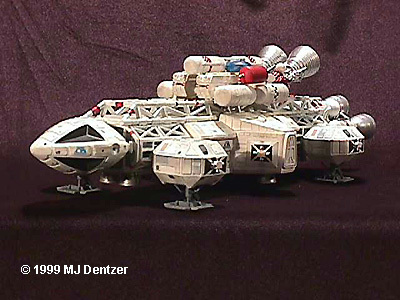 This is an excellently cast resin set that's well detailed, although not completely accurate. The lab module comes with standard pod landing pads and rocket exhausts on the underside, so I dremmeled these off and replaced the pads with trimmed-down Eagle main pads. 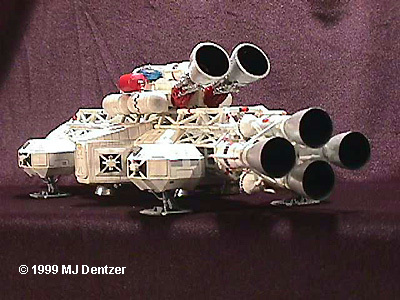 I also replaced and repositioned the rocked exhausts with those from the Eagle service module. 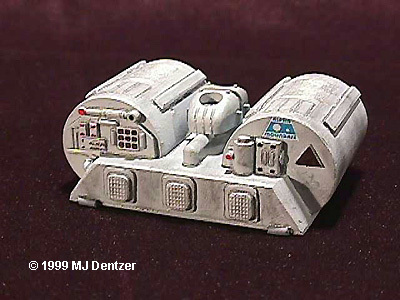 I also added the eight small half tanks around the bottom sides of the pod. Painted and weathered as above, this is really a fine representation of the lab module seen in the show's second season. Again from SMT, the spine booster was part of the accessory kit. Although finely crafted, detailed, and a good representation of the subject, it is a bit oversized, as compared to the original, and is a bit overwhelming when mounted on the eagle. The top tanks especially are larger than the film version, and I mounted them as low as I could. I also replaced the standard Eagle exhaust bells with two engines I had from the second stage of a Saturn V, just because I liked the added detail. It was painted flat white overall, the two side tanks insignia red, the pill-shaped tanks flat blue, and weathered with pencil. The only detail needed that the kit didn?t supply are the elbow-shaped piping on the middle side tanks--again, paper clips to the rescue. I also decided to forgo the plastic mounting clips that came with the kit and instead use a soft, bendable wire to mount it to the spine. The checkered decals I found in the race car section of my local hobby shop, and the red and black striping are from the Tangents Eagle decal set. 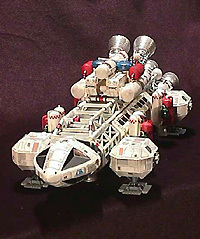 This is just a standard transporter pod fitted with side boosters I built scratch from styrene tubing, capped with thick styrene rod from scrap sprue and sand-dremmeled to shape, and detailed with wire piping. The exhaust nozzles are again from an Eagle service module. It was painted MM white, insignia red, beret green, silver, and flat black. The checkered sections were hand drawn with fine permanent marker.